When Patrick Blanc was a boy, he suspended plants from his bedroom wall and ran their roots into a fish tank. The greenery received nourishment from the diluted—ahem—fertilizer and purified the water in return. Forty-five years on, the French botanist’s gardens have grown massive in scale. One inside a Portuguese shopping mall is larger than four tennis courts, and there’s one in Kuwait that’s almost as big. But Blanc’s recently completed facade for the Athenaeum hotel in London (shown) could be his most high-profile project yet. Looming over Green Park, it’s an eight-story antigravity forest composed of 12,000 plants. Garlic is a staple of companion planting. It produces a natural fungicide that benefits many plants in organic gardens and repels many pests.With a little planning, the organic garden will benefit immensely from garlic. Plan your garden, herb and flower bed ahead of time because garlic should be planted in the fall. Use markers to identify where you have planted garlic so as not to disturb them in the spring when you begin to plant companion plants near them. Plant garlic bulbs near roses. In the organic garden, garlic assists roses with disease prevention, repels aphids, ants, snails and other pests. Plant garlic as a beneficial companion to vegetables such as spinach, potatoes, eggplant, tomatoes, peppers, cabbage, broccoli and kohlrabi to fend off aphids, cabbage worms, slugs and other pests. Plant garlic and carrots together to confuse carrot flies and avoid root maggots. Garlic and beets are beneficial to each other in fending off various leaf hoppers, destructive worms and flying pests. Garlic repels fungus gnats, codling moths, cabbage loopers and Japanese beetles in an organic garden. Plant garlic amongst herbs such as yarrow, summer savory, rue, chamomile and dill. Garlic will repel spider mites for dill. Rue deters maggots for garlic. Yarrow and summer savory improve the overall health and production of garlic and chamomile will improve its flavor. Plant garlic with flower companions such as marigold, nasturtium, geranium and petunias to repel pests above and below ground. Garlic will also aid in deterring pests from these flowers in an organic garden. Deer and rabbits may also stay away from flowers when garlic is used as a companion plant. Plant garlic away from where beans, peas, parsley and sage are going to be planted. These plants will be harmed by the closeness of garlic. This post focuses on the factors that we believe helped save our place and includes aspects of our permaculture design intended to reduce the threat, as well as what we learned from our recent experience. Comments relate specifically to our location and personal observations, and may not apply under different conditions. Our house is mudbrick with small amounts of exposed timber and built on a slab. Embers blown up against the exposed slab are easily spotted and extinguished. Exposed timber surfaces are smooth so embers blow off. We kept the house profile low so that a firestorm’s embers and radiant heat would largely pass overhead. Before and during the fire we continually wetted down external surfaces-especially vulnerable parts of the roof structure. The eastern wall is earth covered, giving that wall more protection and allowing us to gain quick access to the roof. 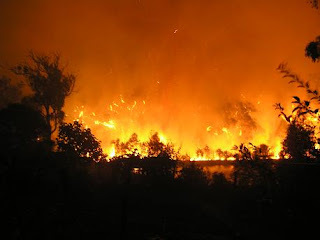 On the northern side (the most likely direction of a firestorm) the bulk of the forest is 80m away. We located our dam and vegetable patch between us and the forest to create a low risk buffer. As fires tend to race up slopes we built our house on an area with a low gradient. Our orchard is located to the northeast of the house providing another green buffer and a wide driveway with cleared sides provides a firebreak to the west and south. This photo is taken from our roof looking north. The burnt forest can be seen on the other side of the dam. Discover the regions of your state then find the frogs of a particular region. The Right Livelihood Award honours and supports those offering practical and exemplary answers to the most urgent challenges facing us today. In many countries, the Award is often referred to as the ‘Alternative Nobel Prize’. “I grew up in a small village in Tasmania. I was born in 1928, but my village might have existed in the 11th century. We didn’t have any cars; everything that we needed we made. We made our own boots, our own metal works, we caught fish, grew food, made bread. I didn’t know anybody who lived there who had one job, or anything that you could define as a job. Everybody had several jobs. Trying to research on Google Permaculture material? Why not see the results in a Google “Wonder Wheel”? The “Wonder Wheel” is like a mindmap result search view. Just click on the key word you are interested to see related search results shown on the right hand side of the screen. You can filter the results by selecting the right option on the left hand side screen options.